"The story of the man who created a legend, an empire, and a billion-dollar bosom!" The only thing "amazing" about The Amazing Howard Hughes, the 1977 miniseries produced to cash in on the notoriously elusive, reclusive hypochondriac's recent death, is that it turns the life of a fascinating man into little more than a dry history lesson. Hughes story has certainly been captured better elsewhere, particularly in his brief appearance in Tucker: The Man and His Dream. This DVD presents an edited version of the original 215 minute runtime, but if the excised 75 minutes were as dull as what's actually here, I can't say I'm saddened by the loss. The film suffers from the "biopic" syndrome. Based on the biography by Noah Dietrich, it's content to merely chronicle the man's life without actually revealing anything about him, about his inner workings. It's true that Hughes was very secretive, but if I'm going to be expected to feel for a character, I'd like to feel like he's more than merely the human embodiment of a few key historical events. Citizen Kane was obviously an inspiration, as there is the occasional use of newsreel summaries and commentary, but the filmmakers seem content to remain focused on the public perception of the man, rather than on his character. There's a momentary flash of Hughes' childhood, which may have been fleshed out in the unedited version, in which the seeds of his interest in aviation are shown, but it's hardly a "Rosebud" setup, and the film jumps ahead very quickly to his father's death and his inheritance of the family fortune. From there, we follow Hughes on his rise to fame and power. He gained notarity in the aviation business, owned a chain of hotels in Las Vegas (spoofed in the James Bond film Diamonds Are Forever), and became preoccupied with motion pictures. He did finance a number of films, including near classics like Scarface, but he's most remembered for his obsession with Jane Russell's ample bosom. His love for aviation is perhaps what he's best remembered for. The film recounts the tent pole experiences, including his near death in a crash in 1946. Chronicled in detail is the creation of his most famous folly, the Spruce Goose, the wooden cargo plane that Hughes developed for the government, funding the project with millions of taxpayer dollars. He flew the plane himself on its first disastrous test run, and thousands of spectators looked on as the craft was able to stay in the air for less than a few moments at a time. Around this time, Hughes became preoccupied with germs, and as he aged, he slipped into insanity, his obsessive-compulsive disorder eventually ballooning into paranoia. Though he made a fortune as a Las Vegas mogul in his later years, he was treated by the press as little more than an eccentric loon. The film depicts all of this and more, yet Hughes himself remains elusive. Perhaps no one knows what really drove him. That's fine. I'll take a little fiction in my biographies if it means they're, well, interesting. Tommy Lee Jones handles the title role rather well, even under pounds of old age makeup during the latter portion of the film. He's never really able to get underneath Hughes' skin, but he's at least interesting to watch (his uncanny resemblance to the man doesn't hurt). Unfortunately, he's done no favors by the uninspiring, strictly TV-caliber direction from William A. Graham, who tuned the TV biopic into something of a cottage industry, eventually directing films about such luminaries as baseball player Ron LeFlore and People's Cult leader Jim Jones. Though I've not seen his other films, I can only hope they were more successful in turning sensationalistic history into equally fascinating films. Image Transfer Review: Though originally produced for TV, the film is offered in 1.78:1 enhanced widescreen, likely because it played in the format overseas. Quality is none to impressive, but considering it was a television miniseries, such is forgivable. Colors are dull and the image is soft and hazy. Detail is poor, darker scenes look indistinct, and the source materials show some dirt, particularly in brighter scenes. Audio Transfer Review: The mono soundtrack is fine, but a little thing. Dialogue is clear, and there's no audible background hiss, but the music is lacking fidelity. Towards the end of the film, audio drops out a bit, sounding muffled and flat. Extras Review: Aside from a text bio of Tommy Lee Jones and a poster and still gallery, Anchor Bay has included an interesting historical oddity�a two-minute newsreel documenting the first flight of the infamous Spruce Goose. 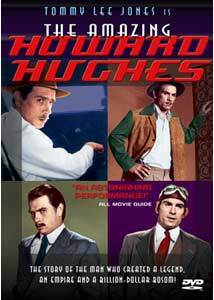 Though it works well enough as a history lesson, The Amazing Howard Hughes fails as a piece of entertainment, despite a worthy performance from Tommy Lee Jones. Anchor Bay's DVD is of decent quality, but fans will probably be disappointed that only the truncated version of the original miniseries is included.